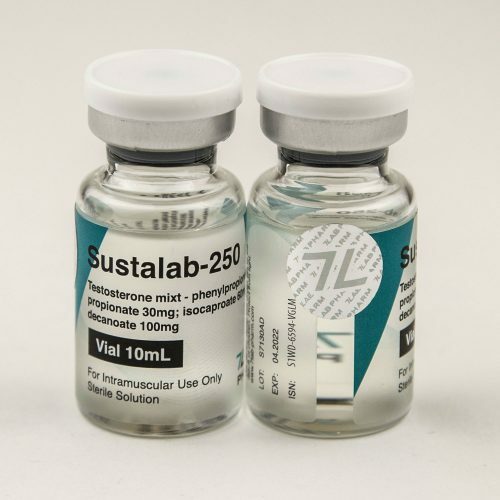 Sustalab-250 is a steroid drug that is a mixture of Testosterone esters. It includes 4 esters: propionate, phenylpropionate, isocaproate and decanoate, balanced in such a way that the body maintains the most consistent hormonal background. Sustalab-250 is included in the work almost immediately due to the “fast” ester of propionate and leaves the body completely only for 3-4 weeks, due to long esters. Accelerated growth of muscle mass and strength, acceleration of the overall recovery of the body between the stresses, increased vitality. Formation of male secondary sexual characteristics: growth of facial hair, coarsening of the voice, and so on. Accelerating the utilization of fatty deposits in the background of a diet with a caloric deficit. A positive effect on the health of joints and ligaments (due to water retention). This drug is probably most convenient to use, in terms of injection frequency, the choice of dosage, in addition, it will provide the most even background of the hormone in the blood. Based on the concentration of testosterone per ml of solution, you should take Sustalab-250 in a dosage of 250 mg / ml. This is the optimal dosage for a beginner, which will provide the maximum result from the drug with a minimum of side effects. The Sustalab-250 cycle should ideally last 8 weeks. On the course, it is necessary to monitor the level of estradiol in the blood, and in case of its elevated level, take an aromatase inhibitor (Anastrozole). The sportsmen leave extremely positive reviews about Sustalab-250. Exogenous testosterone is most naturally perceived by the body. With proper application, it will become the most powerful weapon in building muscle mass and strength. In addition, reviews of Sustalab-250 indicate that the drug has a pronounced positive effect on the joints and ligaments. Therefore, if you have complaints about health of joints, this drug will be doubly like you.